Dr. Ie-Ming Shih is a Tina’s Wish Individual Grant Recipient and one of the four researchers collaborating under the Tina’s Wish Consortium Grant. Dr. Shih coordinates the inter-disciplinary efforts of the oncology, gynecology and pathology departments to study ovarian cancer. These departments are all asking themselves, “how can we conquer gynecologic cancers, especially ovarian cancer together?” Dr. Shih facilitates the interdepartmental and interinstitutional collaboration. (Dr. Shih’s research website: gynecologycancer.org). Click to jump to full bio. What led you to your focus in gynecologic pathology? I realized I wanted to be a pathologist when I was at the University of Pennsylvania as a PhD student. I had the opportunity to observe tissue samples and realized, “WHOA this is great – it’s a new world under a microscope.” Every single cell is either normal or abnormal (like a cancer cell) and it tells its own story. A single cell is just like an individual person. If you have hundreds or thousands of cells, it’s just like a society – the cells interact with each other, they talk to one another privately and publicly. Pathologists observe the patterns and architecture of cells and tissues. We also focus on individual (single) cells – we study their nuclear features, their abnormal features, and ask how they become abnormal. This is what fascinates me and inspired me to become a pathologist. How would you explain your research to a layperson? What is PapDREAMing? My team (in collaboration with several other teams) has demonstrated that DNA sequencing-based tests can identify gynecologic cancers by detecting cell mutations in DNA derived from cervical vaginal fluid collected during a routine Pap smear. While these mutation-based approaches have shown great promise for early detection of endometrial cancers, neither they, nor any other diagnostic method, has yet achieved the performance and affordability required for use as a general screening tool for ovarian cancer. There remains an urgent need for an improved approach to early detection of this deadly disease. That’s where epigenetics and PapDREAMING comes in. Epigenetics refers to external modifications to DNA that turn genes “on” or “off.” These modifications do not change the DNA sequence, but instead, they affect how cells “read” genes. Epigenetic alterations are great biomarkers for cancer, due to their frequency and noninvasive accessibility in bodily fluids. One example of an epigenetic change is DNA methylation — the addition of a methyl group, or a “chemical cap,” to part of the DNA molecule, which prevents certain genes from being expressed. My team has identified unique epigenetic methylation markers as being highly sensitive and specific to ovarian cancer, even in the early precursor stages of the disease. 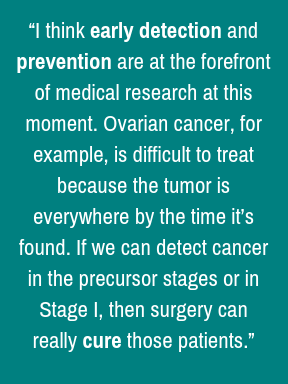 Methylation becomes abnormal when the normal cells become cancer cells so that is why we can use the methylation as a biomarker for the ovarian cancer cells. If there is any ovarian cancer or the precursor lesions in the fallopian tube, the tumor cells will be sent to the uterine cavity and the cervix. Meaning, they will travel far away from the ovary and fallopian tube, through the uterine cavity, down to the cervix, where we can catch them. Although it happens rarely, maybe one out of 1,000 cells, our technology called DREAMing can identify these cancer cells. DREAMing itself is the technique we developed at Johns Hopkins to detect and quantify tumor derived DNA within cervical vaginal fluid using a panel of four to six epigenetic methylation biomarkers. Since we use a Pap Smear to collect the fluid and our DREAMing technology, we named this approach “PapDREAMing”. What are the next steps/milestones for this research? The next step is to try to make a nano (small) device that is “microfluidic,” meaning it’s based on the very small amount of fluid and the flow in the very small space of the chamber. We only need a very small test sample, then put a chip-like device inside the test tube and we can run the test without going back to the lab. This transition from the prototype of PapDREAMing to this nano device is important to future gynecology clinics – doctors will be able to use this device easily and conveniently to detect ovarian cancer, rather than having to send a specimen to a lab. We need big sample sizes. We need at least 1,000 women with different ovarian cancer stages and healthy women as the control. We need to test our technology in a large population of women with the potential of developing ovarian cancer. We must think about cost. If the device is successfully developed, and finally introduced to the clinic, the next question is how much the patient can afford to pay for the test. Can you explain the difference between your work within the Tina’s Wish Consortium vs. your Tina’s Wish Individual Grant Award? With the individual grant, we are focusing on the development of the PapDREAMing technology and establishing a prototype for a clinical test. The Consortium Grant is focused on further understanding the biology of ovarian cancer precancerous lesions. If we identify new biomarkers, we can use PapDREAMing to detect ovarian cancer precursors (before they become cancer) in the future. My individual grant compliments the Consortium Grant very well. The projects answer different questions, allowing us to be more knowledgeable and productive. We are not treating diseases, we are treating human beings holistically, one person at a time. Besides studying the pathology of human tissues and cells, in recent years I’ve developed an interest in studying the pathology of human suffering, meaning psychological suffering. I think this is important because every single person in the world will suffer from time to time – and not only physically, but mentally. If a patient can become more optimistic, they will be happier, their immunity will increase, and they can live longer lives. I think this is an important concept that is missing in medicine at this moment. I’m almost finished writing a book about this concept. I started from a very scientific viewpoint on how humans can suffer especially when they have diseases like ovarian cancer, then I described how they can potentially overcome this mental suffering. We are not treating diseases, we are treating human beings holistically, one person at a time. 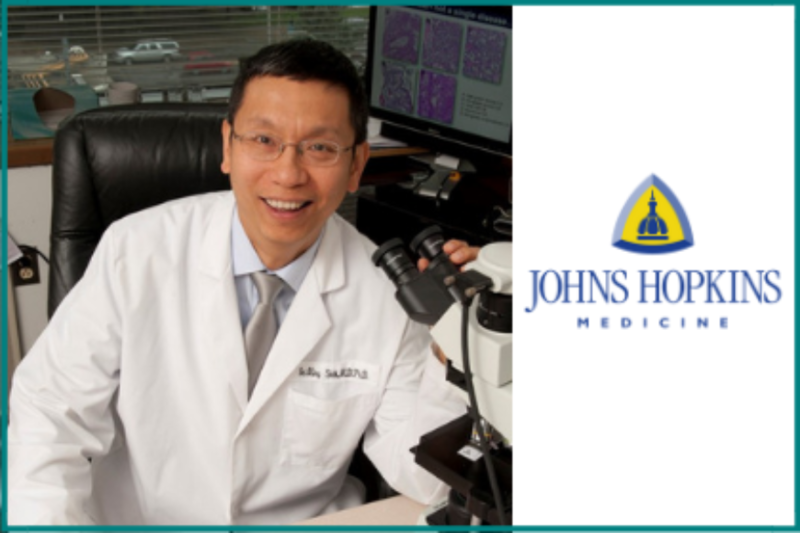 Dr. Shih is the Richard W. TeLinde Distinguished (endowed) Professor of Gynecologic Pathology, Department of Gynecology and Obstetrics, the Director of the Interdepartmental Gynecologic Pathology Research Program at the Johns Hopkins University and the Co-Director of the Breast and Ovarian Cancer Program, Sidney Kimmel Comprehensive Cancer Center at Johns Hopkins. He is also the Principal Investigator in a National Cancer Institute sponsored large project called Specialized Program of Research Excellence (SPORE) of Ovarian Cancer. 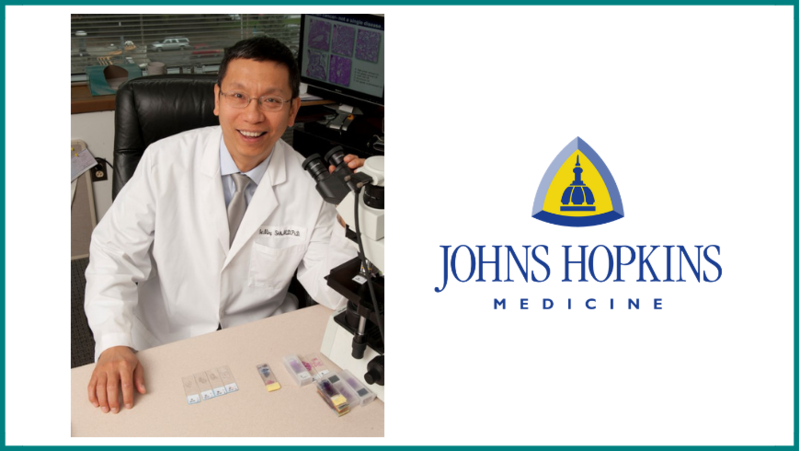 CLICK HERE to learn more about Dr. Shih’s research. 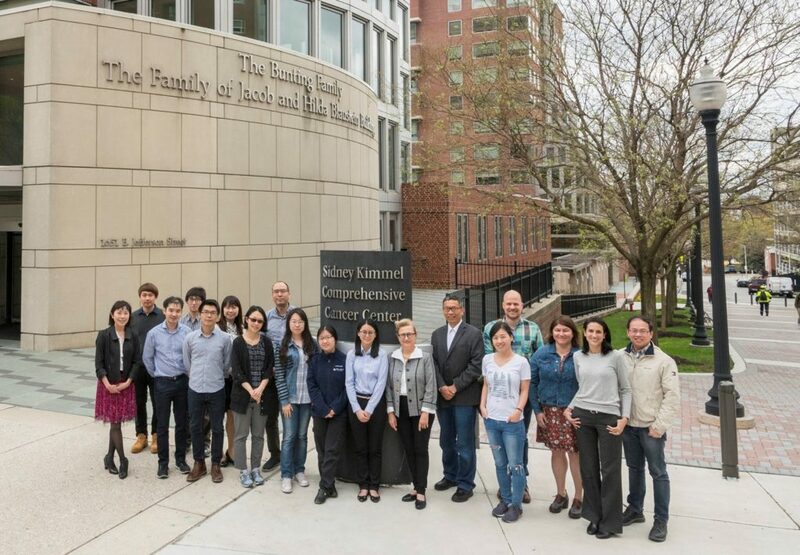 On behalf of the Johns Hopkins research team involved in this project, I would express our most sincere gratitude for the Foundation and all of you who made the contributions so we can work together to fight with ovarian cancer. Several key scientists in this team are Drs. Thomas Pisanic, Jeff Wang and Tain-Li Wang who advance the technology and design the study. We look forward to delivering this new test for early detection of ovarian cancer in the near future!